Vogue 1465 is all finished! Or unfinished, might be a better way of putting it. Whilst you’re here, did you know Vogue patterns in the USA have a sale on at the moment? That’s unless you’re reading on catchup. I know shipping to the UK is expensive but if you order 3 patterns then it’s usually worth it. Just. Especially if you want one of the newer ones. Like this one, which might just have fallen into my shopping cart. So, I used a double faced wool knit fabric, purchased a while back from myfabrics, I think. It’s pretty bulky, but a good match for this project, which requires 2 good sides for your fabric. 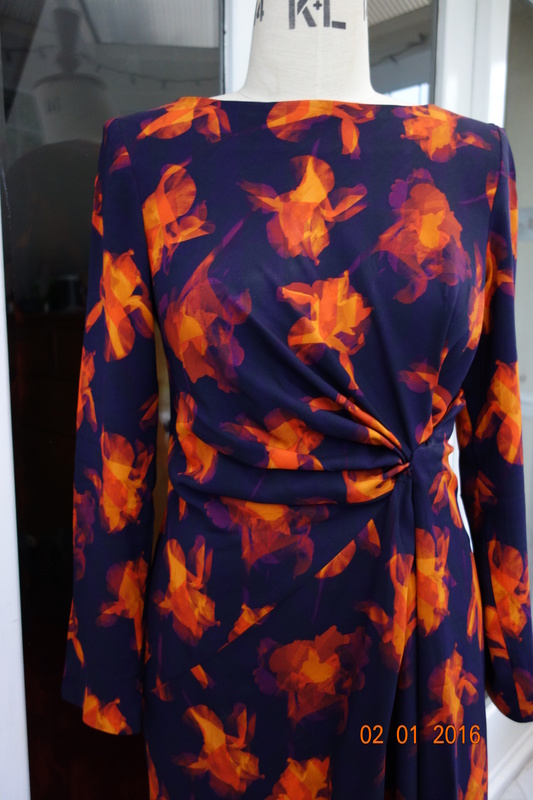 The design is a cross between a jacket and a cardigan really, which suits my lifestyle and this one is planned to wear at work, with the skirt I made last week. It was very easy to put together but I changed a few things. I didn’t bind my seams on the inside, as knits don’t ravel and binding on very thick fabric is sheer madness. I did dry it. That was a waste of half an hour. Also, to finish the lapels and hems, they have you fold back the edges back on themselves and then put in many parallel lines of topstitching. I tried it again, but didn’t like that either. So, I settled for second best. No finishing at all! I’ve seen this look on many top end designs, where they make a feature of the seams, leaving them unfinished and exposing them on the outside. I have to say this really took me out of my comfort zone, and I still can’t decide whether I’m happy with it or not. I think it’s because I’m mostly used to trying to make my items look less homemade, and this does almost look like what I produced when I was first learning to sew. All I can see, when I look at it, are seams that need finishing. As my IT friends would say, it’s probably a sewers version of a PICNIC. All the seams are lapped, then sewn together with a single line of topstitching, then trimmed to size. This was a bit time consuming, as you can’t use your sewing machine foot to guide you. So each seam has to be marked and hand tacked (basted.) I saved time in other ways, so still pretty quick though. Ah, well, only time will tell. It’s a versatile piece, hopefully, and very comfortable, so I’m anticipating it will probably get worn lots. Next, a coat. This one, from the Maker’s Atelier, a designer whose patterns have caught my eye for a while, but whose rather high priced charms I’ve managed to stave off until now. I bought my check fabric from Fabworks, in their actual shop, not the online version, with the original idea to make a Vivienne Westwood style draped skirt from it. 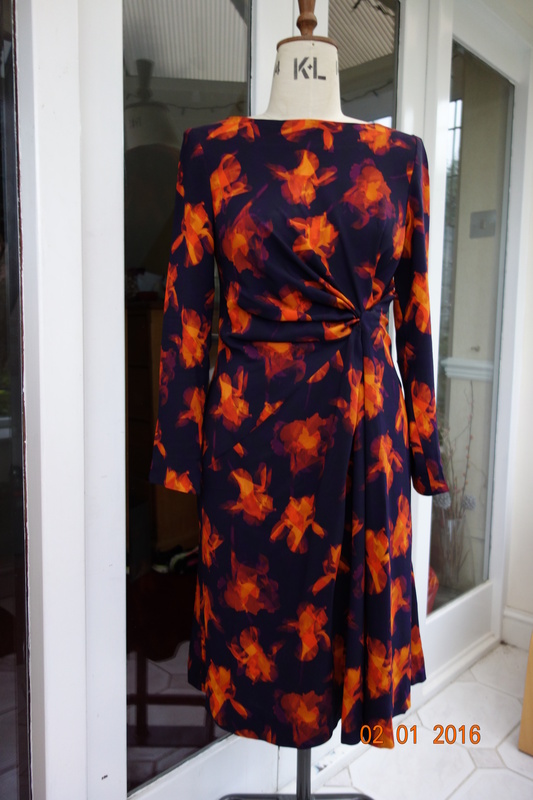 I have tried draping things myself, with a little success, but as soon as I saw the Emily skirt I realised I had an easy excellent match. The fabric is a wool blend and was lovely to work with. It’s a medium weight with just enough drape for this pattern. I’d not recommend anything firmer, as there is a lot of pleating, and the waist seam can get bulky in places. A medium weight viscose or linen fabric would be good too. My first challenge was accepting that pattern matching was going to be imperfect, as the front sides of the skirt are on the bias. I did my best, however, and I think I just about got away with it. I cut the waistband on the cross-grain. The invisible zip went in easily, after stabilising the seam with this, from English Couture, although it had the usual dent at the bottom due to being inserted into a curved seam. If anyone knows how I can get rid of it please do let me know. I used their firm, coat weight interfacing on the waistband, and their silky touch on the facings. The pattern has some nice touches, like the single pocket in the right hand seam, the extra wide waistband and a separate hem facing. I also added a short lining, as I think wool needs it, just to cover the main areas of stretch. I used the back pattern piece for both front and back. I don’t sew the darts, just make a pleat to take in the excess. I would say it also runs on the large size, especially at the waist. Like the Big 4 really. I did have to take it in slightly there as a result. It also hits just above the knee, even on me at 5’4″ so if you’re taller, you might want to think about lengthening. I got it out of just over a metre of fabric. I have already cut out the jacket to go with the skirt, as the second item for my 3 pack. V1465, a Donna Karan pattern. My fabric is a double sided knit, black on one side and forest green on the other. I’m planning to use the green as the main colour, as black does not really go with my colouring. I’m now trying to decide on the 3rd item, to go with the jacket and skirt. It definitely needs to be fitted in style, but other than that I can’t make my mind up. So. much. choice. I think I’ll get a better idea when I make up the jacket. Happy New Year, everyone. I hope you all had a satisfactory holiday experience. My Christmas fully met my expectations, again, this year. The build up was dreadful, the actual day was averagely good and the aftermath was most enjoyable. Having a week and a half off work, however, and a trip away to see the in-laws has certainly helped me to refocus, and, although I don’t believe in resolutions, there’s a few things I’d like to work on in in 2016 . These are definitely”process” related, not ends in themselves, as these work better for me than the “lose half a stone” kind. So, I’ll continue to challenge myself to sew more efficiently. That is think through whether I really need to visit the ironing board every time I sew a seam, and to continue to not use pins, except when absolutely necessary. Also to cut out more items in advance, in bulk, amongst others. Also, continue to explore how machine knitting can help me realise the items I need, which can’t be hand knitted easily. I really do need to find a new place for the machine as it’s tucked away, and easily forgotten. Once I do that I think I’ll be good. Connect more with fellow sewers and knitters. I used to run a Sewing Club and attend local knit nights, but haven’t done much in 2015. I’d like to change that. More immediately, I wanted to start sewing for the SWAP challenge this year and have already found lots of co-ordinating patterns and fabrics to sew. Already, I’m struggling, though. Being so committed for 4 months, which is the length of the challenge really weighs heavily on me and I’m finding it difficult to get motivated. Trying to convince myself that I can take a few items at a time doesn’t seem to be working that well, but I’m still in and will see if I can get it going. 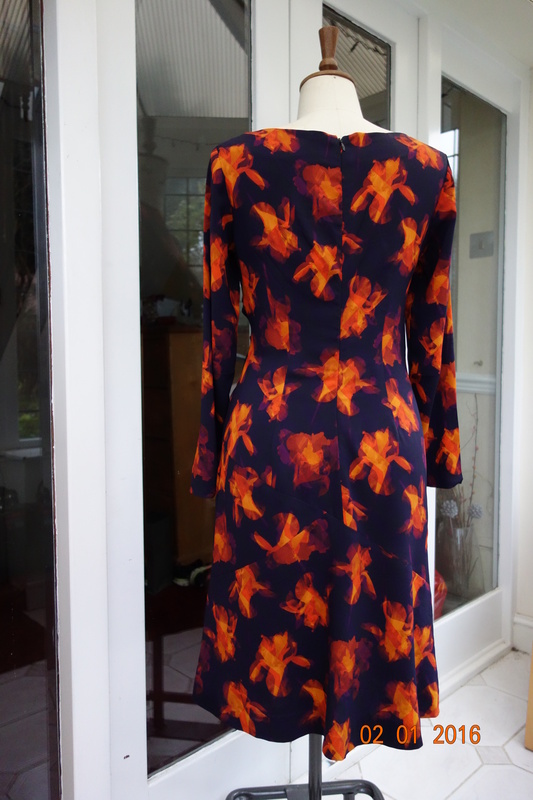 It’s another Burda, from December 2012, but tracing it was a real feat as the pattern pieces were absolutely massive! 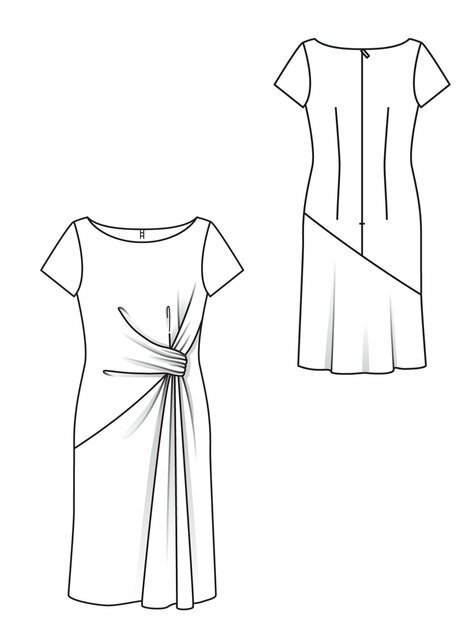 I love the asymmetry though, and thankfully Burda did a full feature how to put it together, as it wasn’t intuitive. My new A0 size cutting mat came in really useful too. Rotary cutting using big mats is the efficient way to go. Thank you Santa! The fabric has stretch and had just the right amount of drape. It went together beautifully and I’ve worn it to a New Years Eve Party already. It was very comfortable after all those Christmas mince pies. I’ve already cut out a jacket and am ready to do the same for a skirt, as part of my first 3 pack. Note to self. DON’T GET DISTRACTED!